Mary Wollstonecraft (/ˈwʊlstən.krɑːft/; 27 April 1759 – 10 September 1797) was an English writer, philosopher, and advocate of women's rights. During her brief career, she wrote novels, treatises, a travel narrative, a history of the French Revolution, a conduct book, and a children's book. Wollstonecraft is best known for A Vindication of the Rights of Woman (1792), in which she argues that women are not naturally inferior to men, but appear to be only because they lack education. 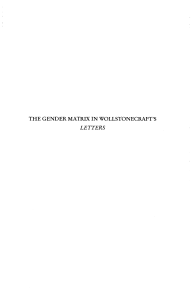 She suggests that both men and women should be treated as rational beings and imagines a social order founded on reason.Until the late 20th century, Wollstonecraft's life, which encompassed several unconventional personal relationships, received more attention than her writing. After two ill-fated affairs, with Henry Fuseli and Gilbert Imlay (by whom she had a daughter, Fanny Imlay), Wollstonecraft married the philosopher William Godwin, one of the forefathers of the anarchist movement. Wollstonecraft died at the age of 38, eleven days after giving birth to her second daughter, leaving behind several unfinished manuscripts. This daughter, Mary Wollstonecraft Godwin, became an accomplished writer herself, as Mary Shelley, the author of Frankenstein.After Wollstonecraft's death, her widower published a Memoir (1798) of her life, revealing her unorthodox lifestyle, which inadvertently destroyed her reputation for almost a century. However, with the emergence of the feminist movement at the turn of the twentieth century, Wollstonecraft's advocacy of women's equality and critiques of conventional femininity became increasingly important. Today Wollstonecraft is regarded as one of the founding feminist philosophers, and feminists often cite both her life and work as important influences.